F.T.A. offers a complete range of suction arms for laboratories, suction arms, hoods, suction arms for chemical and pharmaceutical dust, fumes, vapours and exhalations. F.T.A. also offers a complete range of filters and electric fans for laboratories for dust control, filtration of dust and fumes arising from the preparation of chemical and pharmaceutical products in laboratories. The free-standing arm is the optimal technical solution for the necessary versatility in extracting fumes generated by research laboratories, laboratory fumes, electronics in general, jewellers, test laboratories, engineering workshops, etc. The arm consists of two jointed parts with clamping screws for the exact positioning at the work station. The arms can be fitted with various accessories for anchoring them – the laboratory arms can have a table anchorage while the anchorage can be on the wall or on a special stand for the range of larger arms. The pollutant is extracted via a hood, through the aluminium tubing of the jointed arm parts and, in the end, it reaches the extraction unit and F.T.A. filter or a centralised extraction system. F.T.A. 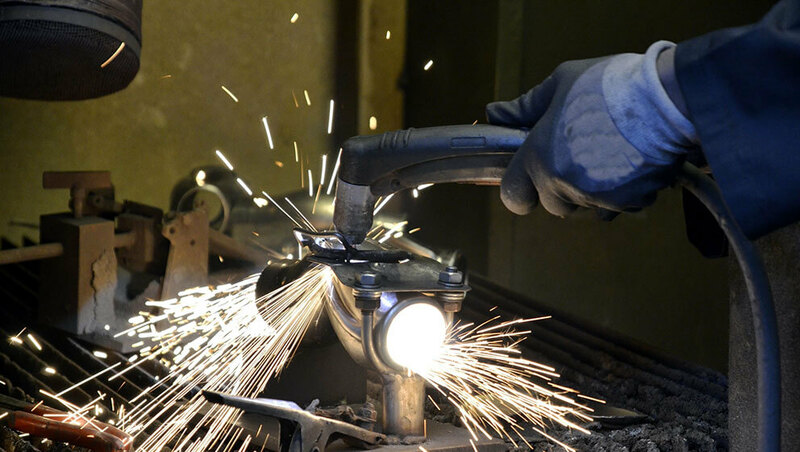 is specialised in the creation of Atex extraction systems for laboratories, Atex arms and filters for potentially explosive dust. 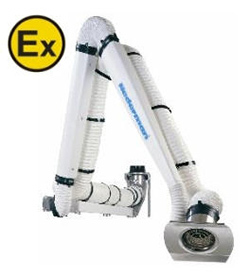 Atex suction arms are suitable for the extraction of dust and gas in environments at the risk of explosion; they are designed to carry pollutants locally, in potentially explosive atmospheres, towards filtration and specific deodorising systems. The use of suitable materials enables the complete earthing of electrostatic charges generated during the passage of air through the hoses. 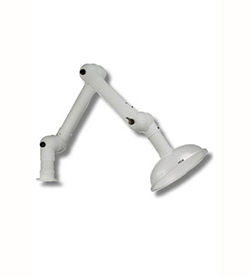 Adjustable bracket-mounted suction arms enable easy and stable positioning to ensure the best extraction efficiency. When connected to a fan they enable work conditions to be improved, capturing gas, vapours, and harmful fumes directly at the source. Available in versions from 1 to 8 m.
The exhaust gas emitted into a closed environment can cause symptoms of intoxication, that may be fatal, after just a few minutes. Many of the harmful impurities and additives in petrol, diesel and other basic hydrocarbons are never destroyed by the internal combustion of the engine; this is why protection with the F.T.A. 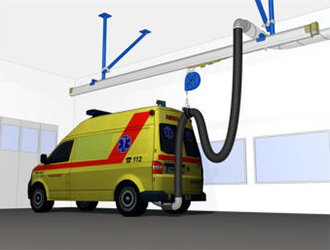 suction arms for automotive exhaust gas is very important.